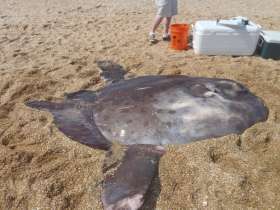 Florida fish and wildlife officials are investigating the recent deaths of three massive ocean sunfish found less than a week apart on three St. Johns County beaches, including Ponte Vedra Beach. On Feb. 16, a 9-foot, nearly 500-pound sharp-tailed mola was found washed up on St. Augustine Beach near A Street around 8 a.m.
Three days later, on Feb. 19, another one washed up on Ponte Vedra Beach, near 159 Sea Hammock Way, behind the Old Ponte Vedra condominiums. Officials had little information Wednesday about the creature's size. Then a deputy found the carcass of a 7-foot, 300-pound sunfish about a quarter-mile north of the Surfside ramp on Vilano Beach around 2 a.m. Monday. Five other sunfish have been found along East Coast beaches since Jan. 11, said Carli Segelson, Florida Fish and Wildlife Conservation Commission Research Institute spokeswoman. "These species are not frequently seen because they are deepwater fish," she said. Last year, seven washed up about the same time of year. Scientists still haven't determined their cause of death and they don't anticipate determining the causes for the most recent ones for months, said Micah Bakenhaster, FWC research division biologist. "It could be something wrong when they are close to shore, but it's hard to say," he said. "Most of the ones we've seen have not shown any obvious signs of disease."